Boston, MA — NAPA is excited to announce the appointment of Mary Peterson as Administrative Consultant, a new position on the NAPA Executive Board and a milestone for the association as it embarks on a new stage of growth. In this role, Mary will provide guidance and administrative support to the NAPA Executive Board, support the planning of NAPA meetings, and interact with other national interfraternal umbrella councils and higher education associations on NAPA’s behalf. Mary Peterson is one of a handful of individuals who was instrumental in the creation of NAPA in the mid-late 2000s. 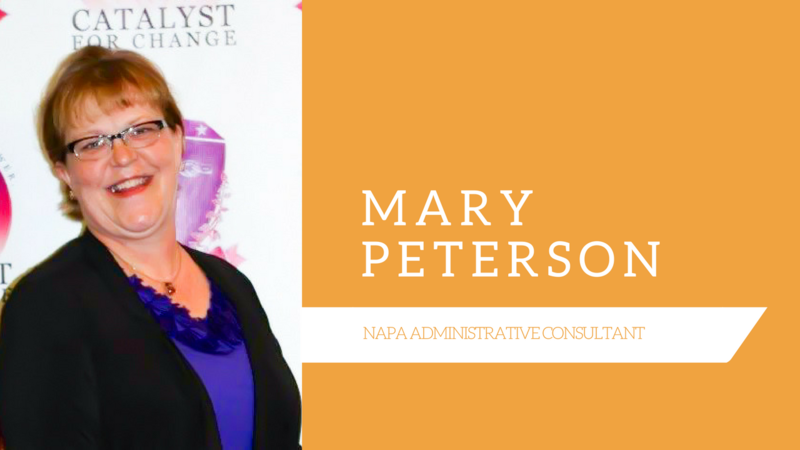 An experienced adviser to many fraternities and sororities across various councils, Mary has worked with several NAPA member organizations one-on-one and brings a wealth of expertise to NAPA’s Executive Board. The motion to add a new position to the Executive Board was presented at NAPA’s Annual Meeting last month in Boston. The addition of the new role, as well as the responsibilities for the Administrative Consultant, were voted and passed among NAPA’s 18 constituent organizations.